We try to show we love each other in the little things each day. For this reason Valentine’s Day often gets overlooked around here. 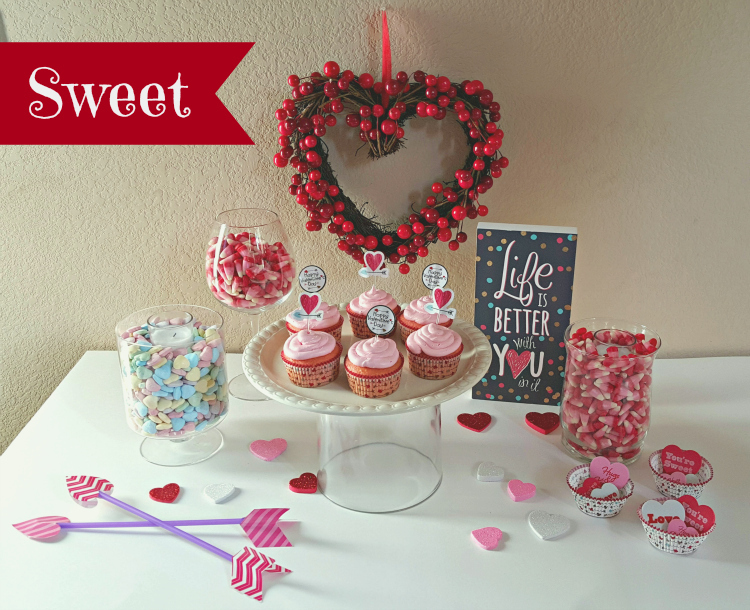 This year I am planning to surprise my kiddos with a fun little display of my affection… in the form of sweet treats! Beat together butter and marshmallow cream until fluffy. Add powdered sugar and Kool Aid. Mix well. Mix in vanilla and milk. Beat until smooth and spreadable. Pipe over your favorite cupcakes. Note: You may need to add more milk or powdered sugar to create the perfect consistency. I use about a teaspoon of Kool Aid, but you may to use more or less, depending on taste. I found a ton of great Valentine’s Day decorations in the seasonal section at my local Walmart. 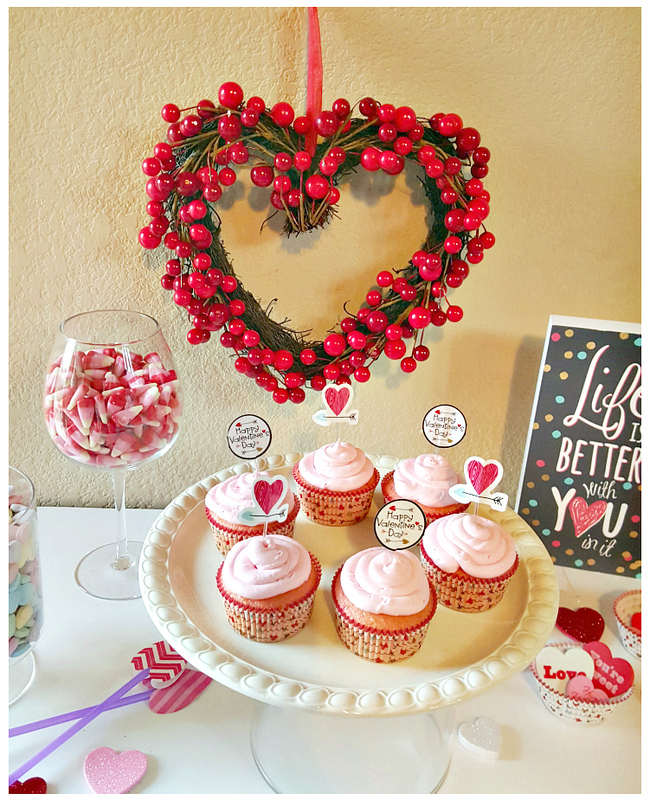 The heart wreath, arrows, heart stickers, cupcake papers, and “Life is better with YOU in it” sign added the perfect little touches to my sweet treats table. 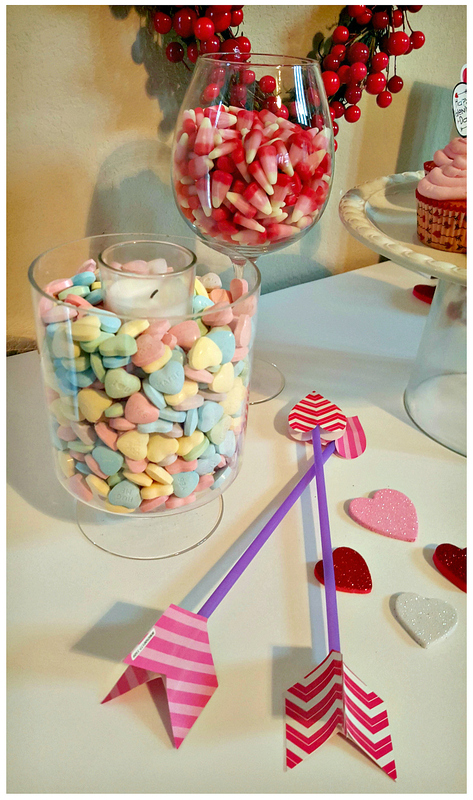 The most fun to create were my candy candle holders. I gathered some of my empty vases, filled them with candy corn and sweet tart hearts, and placed a votive candle in the middle. They would make lovely centerpieces on the table for your Valentine’s meal, but I really like how they look on my sweet treats table! The cupcakes will be gone in a flash, but the candy will last until Valentine’s Day and beyond.